mSupply mobile 2.0 – what’s new? There’s a new version of mSupply mobile out. Here’s a few of the important changes. You can now perform a manual sync at a time that suits you. A link on the top right of the screen shows the sync status. When you create a supplier invoice, finalise it and sync, the recipient store will see a customer invoice at their end. You receive a Customer Requisition when another store wants to order stock from you. By default, you will see a list of requisitions where you have requested stock. In mSupply mobile 2.0, you can choose which supplying store(s) you send your requisition to. Previously you could only use a single store. When store A (Customer) sends a supplier requisition to store B (Supplier), a customer requisition will be created at store B for store A. Finalising the customer requisition will automatically create a finalised customer invoice in store B. 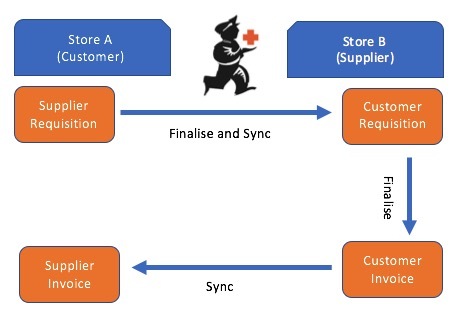 Store A will then receive a supplier invoice from store B when both stores have synchronised.